New England in fall: could it get any better? We don’t think so. Here are some memories from the road trip we took along the east coast one fab fall week. From the rural inland regions of New Hampshire, we make our way toward the coast and the state of Maine, northbound along Route 1. You’re never far from a lobster shack when you travel along the salty coast of New England. Bob’s Clam Hut in Kittery looks a lot like a run-down fast food joint from the outside. However, Bob’s sells appetizing seafood at amazing prices. We buy fresh lobster for a few dollars a pound, before heading north again. The next morning, a pale, ethereal blue sky meets us as we walk out onto Cape Neddick on our way to Nubble. The coast is lined with enormous white wooden houses that glisten in the morning light. We run into Jack Johnson, who lives in one of this small town’s classic Victorian houses with wood paneling and shuttered windows. – The house was built in 1770, by brigadier-general Jonathan Moulton, Jack tells us. When the English came here in the 18th century, the richest of them were given the opportunity to build garish houses along the coastline. – Back then, all the houses were blue—that’s the original New England color, because nobody could afford white—but now, pretty much all you see is the characteristic white shade. The wind carries the scent of seaweed and salty ocean air to us as we close in on Nubble, which is perhaps the finest of the more than seventy lighthouses that dot the New England coastline. A steel swing connects the island to the mainland; it was used as a means of transport by the lighthouse keeper and his family. On our way north, we stop at York Corner Gardens. Here, you can buy milk, cheese, eggs, cranberries, cider, and potatoes, but also reindeer carved from wood and other knickknacks. In front of the shed, an Irish flag and a US flag hang next to each other. – My grandfather came from Sweden, and my Mom was Irish, owner David Coombs informs us. His dog Miss Pearls lies on the ground, watching us warily. Once you get north of York, you simply can’t hurry things. We slowly pass by one beautiful little coastal village after another. The Kennebunks consist of a few small and fashionable communities. From here, you can catch a glimpse of Goat Island and the lighthouse at Cape Porpoise out on the ocean. 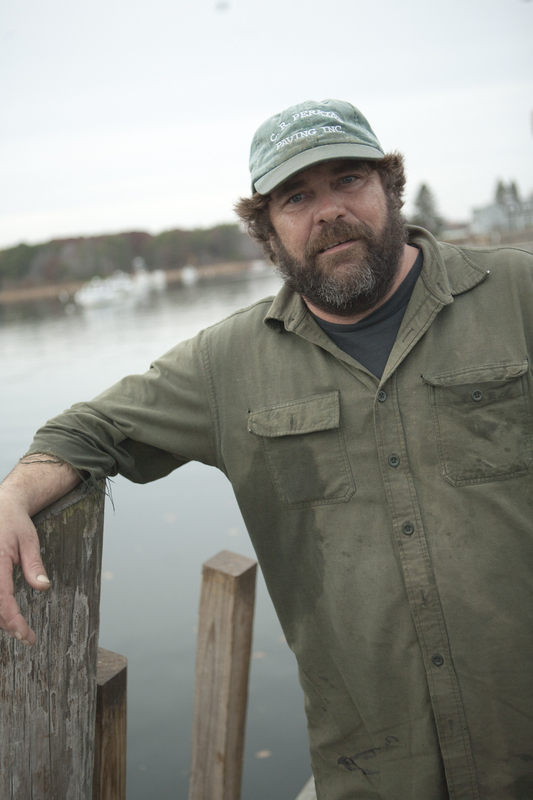 Down in the harbor of Cape Porpoise, we wait for Kevin Perkins, who sails smoothly into the harbor on his skiff, the small dinghy the fishermen use to get to and from their fishing boats. Kevin is a lobster man. One of the places where his catches end up is Roxanne O’Connell’s fish store down by the docks. Roxanne shows us some of the fresh lobsters, which she has placed on a bed of ice. 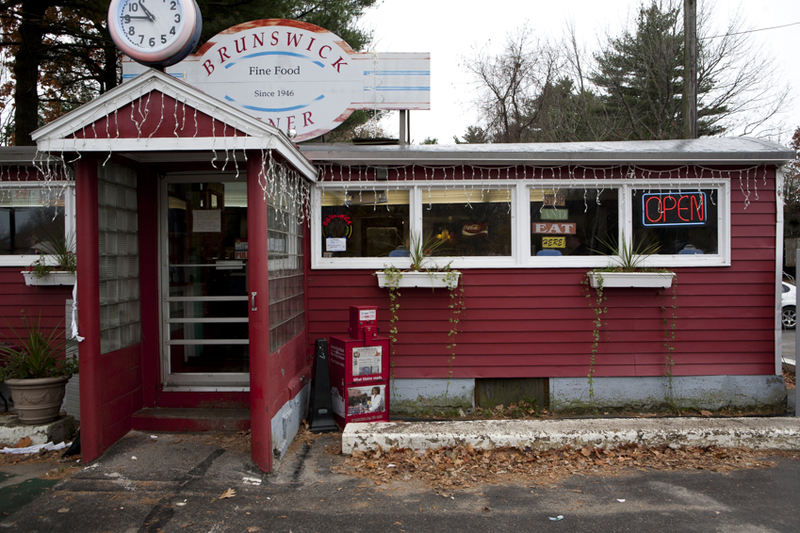 Next morning, we start our day at the Brunswick Diner. We eat thick pancakes with blueberries, drenched in maple syrup, which we rinse down with intensely hot, but bland, coffee. The breakfast options have names like Billie Holiday, Johnny Cash, and the Beach Boys, and consist of fatty foods in various combinations. The colored lights of the jukebox sparkle. For each mile we travel north, the landscape grows more rugged, the morning fog grows thicker, and the swell of the ocean grows higher. 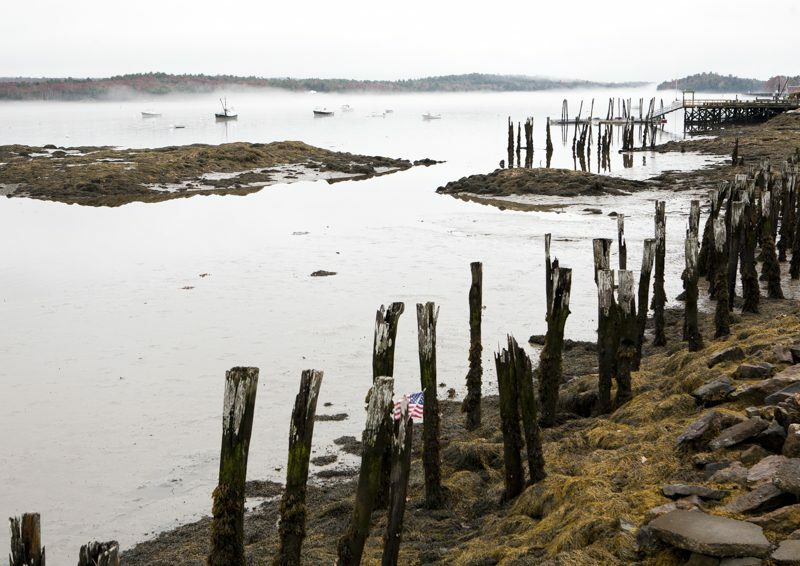 In the small town of Wiscasset, the fog lies low over the ground, and tufts of it dance around over the river Sheepscot. This town was founded in 1663, and the old architecture still attracts visitors. Beyond the river, the trees glow yellow, orange, and gold. Down in the harbor, the fishmongers are filling up bags with fresh fish and seafood. A sign announces “The prettiest town in Maine”. Rockport, which is a little further to the north, has been declared the most beautiful town in America. 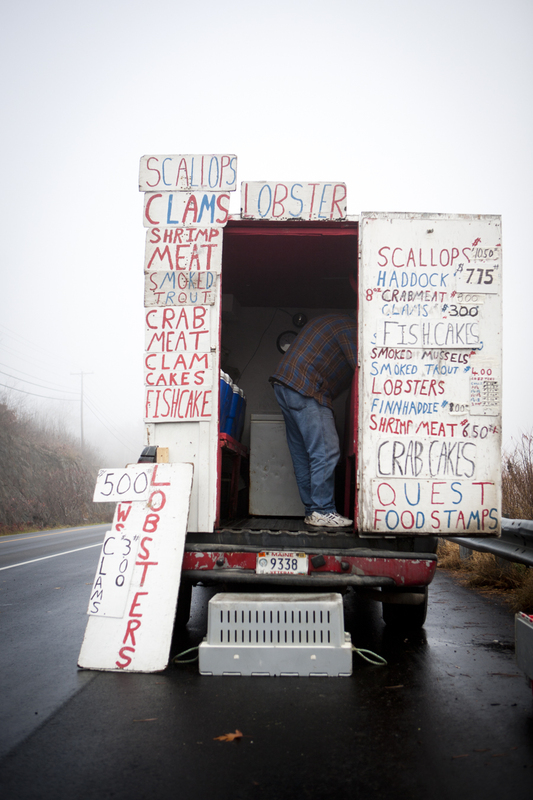 In Penobscot Bay, we stop at a mobile fish store, which carries a sign reading “Dad’s Seafood Lobster” on its roof. The fishmonger tells me that lobster is 4 dollars a pound, and that this is the lowest prices have been in twenty-five years. He shows us scallops, shrimp, smoked mussels, salmon, fishcakes, haddock, and crabs. Then, he explains to us that we simply can’t go home without clam chowder, and soon, we’ve loaded even more stuff into our car. Bar Harbor serves as our base of operations for a few days of exploration in Northern Maine. We recognize the props: Pickup trucks, a trailer piled high with lobster traps, fishermen with thick white beards and worn caps on their heads. We head up the street and visit Roy, who offers 76 different flavors of ice cream. – The lobster ice cream is selling well, of course. In the summertime, it’s total chaos here, Roy explains. The queues reach all the way down the road to the harbor; the children scream in excitement; the parents scream at their children; and everybody who works here screams with excitement over how excited the general mood is; but it’s still great times,” he tells us with a smirk. – -It’s a lot quieter in the fall. States: New England consists of the Maine, New Hampshire, Vermont, Massachusetts, Connecticut and Rhode Island. Great selection. Mike’s Chowder is a classic, that you simply must take home with you. The place to go if what you’re after is a healthy slice of Victorian extravaganza. A charming Inn in Kennebunk. We also like the restaurant. Nonantum in Kennebunk is perfectly located for explorations of the surrounding area. This is where the locals go to do their lobstering. A beautiful little seaside town. Bar Harbor deserves to be on the itinerary of anybody traveling along this coast. 3 road tripswhen you’ve seen the coast. 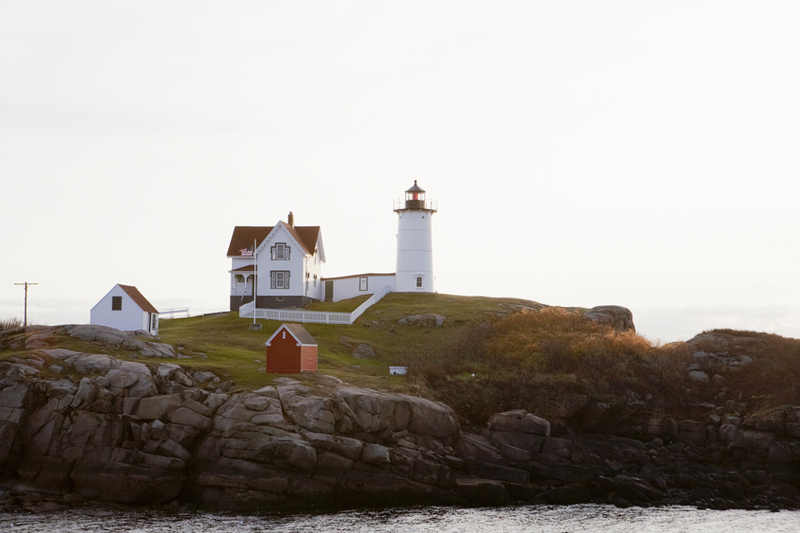 The most famous and well-photographed of New England’s 70 lighthouses. Located by the inlet to the fishing town of Port Clyde. In Cape Elisabeth. A beautiful lighthouse near Kennebunkport. One of artist Edward Hopper’s favorite subjects to paint.